What your dog really wants is the iBone. It’s bigger than an iPhone and smaller than an iPad, which is the perfect size to be carried around in the jaws of your favorite hound. 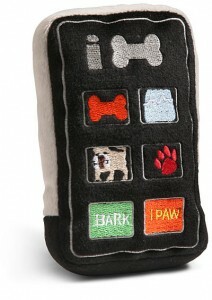 The squeaker is delightfully squeaky and it has embroidered buttons with the cream of the crop of canine apps from the iBone App Store.